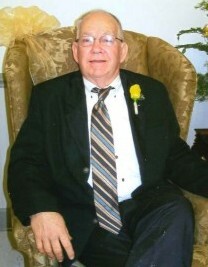 John “Johnny” McMillan Lane, 78, passed away Saturday, March 23, 2019 at his residence. Born March 23, 1941, in Clio, SC, he was a son of the late Stephen D., Jr. and Don Elizabeth McLaurin Lane. Mr. Johnny was a retired Captain with the S.C. Department of Transportation. He was a member of Salem Baptist Church, where he was a deacon, avid usher, Brotherhood director, former youth director and properties committee chairman. Mr. Johnny also previously served a number of years on the Marlboro County School Board. He is survived by his wife, Annie Ruth Quick Lane; sons, Johnny Mac Lane, Jr. and wife Billie Jean of Bennettsville, Jack Monroe Lane of Bennettsville; daughter, Jo Lane of Clio; brother, Stephen “Buddy” D. Lane, III and wife Becky of Clio; grandchildren, John McMillan Lane, III, Donnie Stewart Lane, Ashley Kimrey (Drew), Nina Lane, Audry Hanke, Griffin Lane, McKenna Lane, and Ty Lane; 1 great grandson, Wade Kimrey; 2 great granddaughters, Summer Lane, and Katelynn Lane. Mr. Johnny was preceded in death by his parents; brother, Donald Allan “Al” Lane; grandsons, Brad Lane, and William Chad Lane; great granddaughter, Analea Rogers. A funeral service will be held at 4:00 p.m. Wednesday, March 27, 2019 at Salem Baptist Church, with burial to follow in the church cemetery. Visitation will be from 6 until 8 p.m. Tuesday, March 26, 2019 at Burroughs Funeral Home. Memorials may be made to Salem Baptist Church, 1618 Salem Rd., Bennettsville, SC 29512. On-line condolences may be made at www.bfhbennettsville.com. Burroughs Funeral Home is honored to assist the Lane Family.